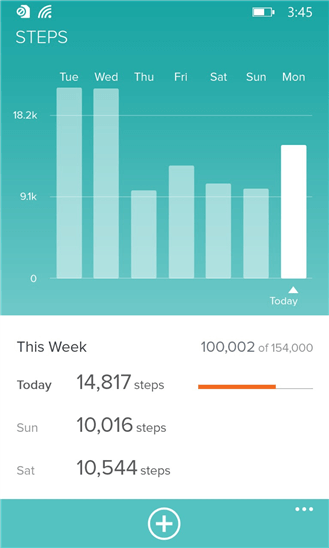 Fitbit has released another update to the Fitbit for Windows Phone app, the 4th month in a row that the app has been updated. The update, version 1.6.206.12403 for those keeping score at home, is mainly focused on improvements for the new Fitbit Charge HR and Surge trackers but there also other changes that all users of the app will appreciate. Perhaps the most important of those general updates is the shrinking of the app down from 26MB in size to 18MB. That may not sound like much but it adds up if you have a limited amount of phone storage left on your Windows Phone. will now see your heart rate appear on those exercises. For all Fitbit for Windows Phone users you now have significant improvements in the Friend Finder part of the app. Now you can add friends from Facebook and with an email address and in general the performance of the friend finder portion of the app is a lot smoother and faster. Along with various bug fixes and improvements, the app has also seen new tooltips added to help you get familiar with the app if you are new to it and improved setup flows when setting up the app and your tracker for the first time. And by-the-way, if you are new to Fitbit you can follow me there at this link. Fitbit for Windows Phone is a free app and available now in the Windows Phone Store. It is a Universal app in Windows 8.1 terms.